I felt inspired to write this post while using a plastic straw from a milk carton to remove a dead cockroach from the drain of our sink tonight. Personally, I thought the plastic straw was an ingenious solution to the dilemma of removing a roach that had clearly been decomposing in our sink for the past few days. At first I was just going to use a plastic bag to reach in and pull him out, but he was kind of hard to reach and probably squishy at this point, and a thin layer of plastic between me and the roach was not reassuring. Then I tried to use the dustpan to fish him out of there, but the dustpan just couldn't reach into the groove of the drain. I briefly considered using a kitchen utensil but since I knew I would never touch said utensil again, figured that it would be a waste. Do you see why the plastic straw was ingenious? Making do with limited resources, that's what life teaches you in Manu'a. But anyway, after that vileness had been removed from the drain, I gingerly prodded the body into a plastic bag and threw him into our small trash bin, which, by the way, we keep a lid on to prevent an ant Bed and Breakfast(/lunch/dinner) from springing up in our trash. The cockroach was medium-sized, in case you're curious. Although I never saw many roaches in the states, so he's medium-sized for Manu'a. To quantify, I think the roach was an inch and a half, but I'm not about to double-check. Oh, the funny part is the story of how that roach got into our kitchen drain. That was a couple nights ago. Erika's washing dishes and then I hear her exclamation, which usually means there's a big Huntsman spider, a crab, or a large cockroach in the immediate vicinity. Standard operating procedure for dealing with these kinds of situations is to yell, create an immediate gameplan of how to remove the offending creature before it crawls/scurries/jumps/vanishes/flies away, and then execute said gameplan. 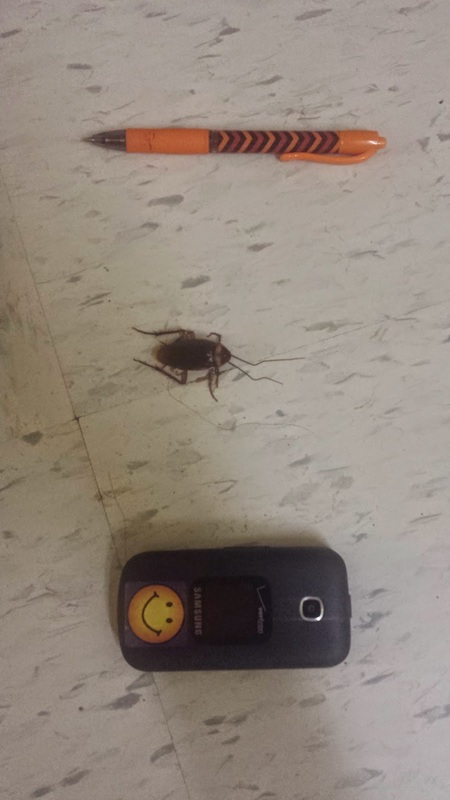 In this case the offending insect is a large cockroach lounging in the sink. We know that the roaches live around our kitchen sink but the unwritten rule is that they come out only at night when we can't see them. At all other times, they're fair game. Erika, having dealt with the "roach-in-sink" situation before, explains that she's gonna turn on the water and immediately start spraying the roach, while I should use the back of the broom handle to force the roach down toward the drain, and then cover him up with the sink strainer so he can't get out. So that the only way he can go is down into the drain, where the water and soap make his prospects grim. The key here is to start spraying the roach with water immediately and to not stop until the sink strainer is covering him up. Or else he will fly away. Because cockroaches here are big and fat, with long whiskers, fast as a cheetah. And they fly. I did not know cockroaches could fly until I came out here. In short, the gameplan is a success and we get that sucker down the drain. I lift the strainer and he's gone, good riddance. An hour later I am washing dishes. Eww! Another roach. Rinse and repeat with the gameplan. Except I guess this guy didn't crawl down the drain but met his death defiantly, right between the drain and the kitchen strainer. I only discovered him today as I was clearing out the strainer on the less-used part of the sink. Needless to say, after two roaches in one night (normally we only see one every couple days) we decided enough was enough. We removed the dishes and sprayed down that sink and surrounding area, AKA Roach Hideout, with Black Flag roach spray. The cockroaches don't die immediately from it, though, since we weren't directly spraying them but rather the areas where they were hiding. This means that they'll crawl out of their hiding spot, and then the spray will begin to paralyze them. So, in the morning we returned to the battlefield (aka our living room and kitchen floor) to assess the success of our airstrike. A dead lizard, poor little casualty of war. And then the enemies: three half-dead roaches. One big one, which I made the mistake of thinking was dead, was only half dead so I had to get him with the broom as he futilely scurried away from me with surprising agility. If I don't write about it later, remind me to tell you about the palm-sized Huntsman that roamed our rooms for a week before Erika killed him, the roach in my room, the crab that wouldn't die, the maggots that crawled on my hands as I scraped maggot eggs off my jars of food, the cockroach that Roy killed in midair, the termites that poop in my classroom, etc. I've got a lot of bug stories, and it's only been a month and a half. Who knew a white girl from Minnesota could deal with this?